Coil building guru Twisted Messes teamed up with CompVape to produce his vision of the ideal RDA for sick coil builds. The result is the beautiful, no-compromise authentic Twisted Messes RDA. 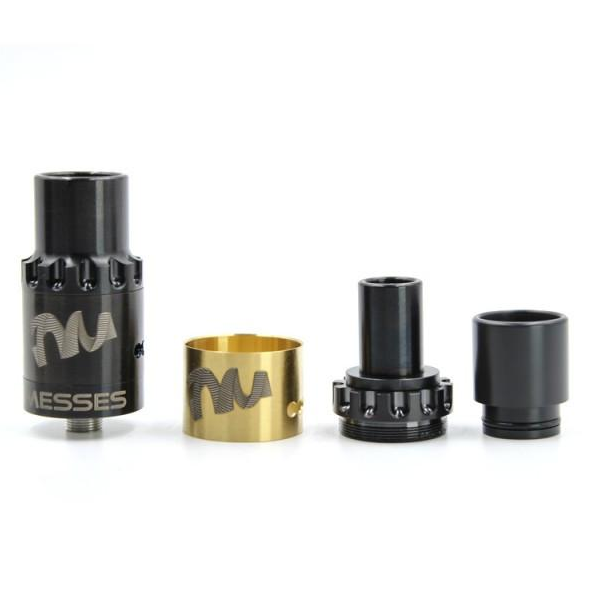 Like the Compvape El Cabron, the Messes has no less than three drip tip/chuff cap options and a removable outer airflow ring. The Messes comes with two outer ring options, a polished stainless steel and a chic gunmetal blue ring, both bearing the Twisted Messes logo made famous on Youtube and Instagram. The mirrored finish on the RDA and removable ring along with the deep knurling on the interchangeable topcaps really sets this RDA apart. It would be an attractive atomizer even if wasn't made to throw competitive clouds. But, no surprise here, a look inside the Messes reveals a purpose-built fog-making monster deck, with four MASSIVE 2.8mm holes on the posit and juice well-milled negative posts. The juice well is a deep 6mm, and the peek-insulated twin posit post has a narrowed trunk at the base, so there's real room in the well. An adjustable, silver-plated and double-insulated 510 center pin is in the middle of the double o-ring base. Bottom line: The Twisted Messes is a competitive RDA that's authentic, serialized and designed to the specifications of a coil-building genius. Uhhh, get one.